↑ 1.00 1.01 1.02 1.03 1.04 1.05 1.06 1.07 1.08 1.09 1.10 1.11 1.12 1.13 1.14 1.15 1.16 1.17 1.18 1.19 1.20 "Facts About Retinitis Pigmentosa". National Eye Institute (in อังกฤษ). May 2014. Archived from the original on 2019-03-07. สืบค้นเมื่อ 2017-12-02. ↑ "โรคอาร์พี". Archived from the original on 2018-11-07. สืบค้นเมื่อ 2014-06-03. ↑ 4.0 4.1 4.2 4.3 Openshaw, Amanda (Feb 2008). Understanding Retinitis Pigmentosa (PDF). University of Michigan Kellogg Eye Center. Archived from the original (PDF) on 2017-08-29. สืบค้นเมื่อ 2017-12-02. ↑ 5.0 5.1 Shintani, Kelly; Shechtman, Diana L.; Gurwood, Andrew S. (2009). "Review and update: Current treatment trends for patients with retinitis pigmentosa". Optometry. 80 (7): 384–401. doi:10.1016/j.optm.2008.01.026. PMID 19545852. ↑ 6.0 6.1 Soucy, E; Wang, Y; Nirenberg, S; Nathans, J; Meister, M (1998). "A Novel Signaling Pathway from Rod Photoreceptors to Ganglion Cells in Mammalian Retina". Neuron. 21 (3): 481–93. doi:10.1016/S0896-6273(00)80560-7. PMID 9768836. ↑ 7.0 7.1 7.2 Hartong, Dyonne T; Berson, Eliot L; Dryja, Thaddeus P (2006). "Retinitis pigmentosa". The Lancet. 368 (9549): 1795–1809. doi:10.1016/S0140-6736(06)69740-7. PMID 17113430. ↑ Daiger, S P; Sullivan, L S; Bowne, S J (2013). "Genes and mutations causing retinitis pigmentosa". Clinical Genetics. 84 (2): 132–41. doi:10.1111/cge.12203. PMC 3856531. PMID 23701314. ↑ "Usher Syndrome". Archived from the original on 2016-08-17. ↑ "Diseases - MM - Types Of Overview". Muscular Dystrophy Association. 2015-12-18. Archived from the original on 2018-01-17. ↑ "Bardet-Biedl (Laurence Moon)". Archived from the original on 2016-08-17. ↑ 16.0 16.1 Rivolta, C.; Sharon, D; Deangelis, M. M.; Dryja, T. P. (2002). "Retinitis pigmentosa and allied diseases: Numerous diseases, genes, and inheritance patterns". Human Molecular Genetics. 11 (10): 1219–27. doi:10.1093/hmg/11.10.1219. PMID 12015282. ↑ 17.0 17.1 Berson, Eliot L.; Rosner, B; Sandberg, M. A.; Dryja, T. P. (1991). "Ocular Findings in Patients with Autosomal Dominant Retinitis Pigmentosa and a Rhodopsin Gene Defect (Pro-23-His)". Archives of Ophthalmology. 109 (1): 92–101. doi:10.1001/archopht.1991.01080010094039. PMID 1987956. ↑ Senin, Ivan I.; Bosch, Laia; Ramon, Eva; Zernii, Evgeni Yu. ; Manyosa, Joan; Philippov, Pavel P.; Garriga, Pere (2006). "Ca2+/recoverin dependent regulation of phosphorylation of the rhodopsin mutant R135L associated with retinitis pigmentosa". Biochemical and Biophysical Research Communications. 349 (1): 345–52. doi:10.1016/j.bbrc.2006.08.048. PMID 16934219. ↑ Dryja, Thaddeus P.; McGee, Terri L.; Reichel, Elias; Hahn, Lauri B.; Cowley, Glenn S.; Yandell, David W.; Sandberg, Michael A.; Berson, Eliot L. (1990). "A point mutation of the rhodopsin gene in one form of retinitis pigmentosa". Nature. 343 (6256): 364–6. Bibcode:1990Natur.343..364D. doi:10.1038/343364a0. PMID 2137202. ↑ Dryja, Thaddeus P.; McGee, Terri L.; Hahn, Lauri B.; Cowley, Glenn S.; Olsson, Jane E.; Reichel, Elias; Sandberg, Michael A.; Berson, Eliot L. (1990). "Mutations within the Rhodopsin Gene in Patients with Autosomal Dominant Retinitis Pigmentosa". New England Journal of Medicine. 323 (19): 1302–7. doi:10.1056/NEJM199011083231903. PMID 2215617. ↑ Berson, E. L.; Rosner, B; Sandberg, M. A.; Weigel-Difranco, C; Dryja, T. P. (1991). "Ocular findings in patients with autosomal dominant retinitis pigmentosa and rhodopsin, proline-347-leucine". American Journal of Ophthalmology. 111 (5): 614–23. doi:10.1016/s0002-9394(14)73708-0. PMID 2021172. ↑ Inglehearn, C. F.; Bashir, R; Lester, D. H.; Jay, M; Bird, A. C.; Bhattacharya, S. S. (1991). "A 3-bp deletion in the rhodopsin gene in a family with autosomal dominant retinitis pigmentosa". American Journal of Human Genetics. 48 (1): 26–30. PMC 1682750. PMID 1985460. ↑ Oh, Kean T.; Weleber, R. G.; Lotery, A; Oh, D. M.; Billingslea, A. M.; Stone, E. M. (2000). "Description of a New Mutation in Rhodopsin, Pro23Ala, and Comparison with Electroretinographic and Clinical Characteristics of the Pro23His Mutation". Archives of Ophthalmology. 118 (9): 1269–76. doi:10.1001/archopht.118.9.1269. PMID 10980774. ↑ 24.0 24.1 "Retinitis pigmentosa". NIH, US National Library of Medicine. Archived from the original on 2019-02-06. สืบค้นเมื่อ 2019-04-06. ↑ Bujakowska, K.; Maubaret, C.; Chakarova, C. F.; Tanimoto, N.; Beck, S. C.; Fahl, E.; Humphries, M. M.; Kenna, P. F.; Makarov, E.; Makarova, O.; Paquet-Durand, F.; Ekstrom, P. A.; Van Veen, T.; Leveillard, T.; Humphries, P.; Seeliger, M. W.; Bhattacharya, S. S. (2009). "Study of Gene-Targeted Mouse Models of Splicing Factor Gene Prpf31 Implicated in Human Autosomal Dominant Retinitis Pigmentosa (RP)". Investigative Ophthalmology & Visual Science. 50 (12): 5927–5933. doi:10.1167/iovs.08-3275. PMID 19578015. ↑ 27.0 27.1 "Understanding Retinitis Pigmentosa" (PDF). Archived from the original (PDF) on 2017-03-29. สืบค้นเมื่อ 2015-03-16. ↑ Fahim, Abigail T (1993). "Nonsyndromic Retinitis Pigmentosa Overview". Retinitis Pigmentosa Overview. University of Washington, Seattle. ↑ Gundogan, Fatih Cakir; Tas, Ahmet; Sobaci, Gungor (2011). Belusic, Gregor, ed. Electroretinogram in Hereditary Retinal Disorders (PDF). Electroretinograms. Turkey: In Tech. ISBN 978-953-307-383-5. Archived (PDF) from the original on 2017-11-17. ↑ "Retinitis Pigmentosa". Archived from the original on 2018-12-22. ↑ 34.0 34.1 Lok, Corie (2014). "Curing blindness: Vision quest". Nature News & Comment. 513 (7517): 160–162. doi:10.1038/513160a. PMID 25209781. ↑ Berson, Eliot L.; Rosner, B; Sandberg, M. A.; Hayes, K. C.; Nicholson, B. W.; Weigel-Difranco, C; Willett, W (1993). "A Randomized Trial of Vitamin a and Vitamin E Supplementation for Retinitis Pigmentosa". Archives of Ophthalmology. 111 (6): 761–72. doi:10.1001/archopht.1993.01090060049022. PMID 8512476. ↑ Berson, Eliot L. (2007). "Long-term visual prognoses in patients with retinitis pigmentosa: The Ludwig von Sallmann lecture". Experimental Eye Research. 85 (1): 7–14. doi:10.1016/j.exer.2007.03.001. PMC 2892386. PMID 17531222. ↑ Humayun, Mark S.; Dorn, Jessy D.; Da Cruz, Lyndon; Dagnelie, Gislin; Sahel, José-Alain; Stanga, Paulo E.; Cideciyan, Artur V.; Duncan, Jacque L.; Eliott, Dean; Filley, Eugene; Ho, Allen C.; Santos, Arturo; Safran, Avinoam B.; Arditi, Aries; Del Priore, Lucian V.; Greenberg, Robert J.; Argus Ii Study, Group (2012). "Interim Results from the International Trial of Second Sight's Visual Prosthesis". Ophthalmology. 119 (4): 779–88. doi:10.1016/j.ophtha.2011.09.028. PMC 3319859. PMID 22244176. ↑ "FDA approves first retinal implant for adults with rare genetic eye disease". Archived from the original on 2013-07-27. ↑ "'First Bionic Eye' Retinal Chip for Blind". Science Daily. 2013-06-29. Archived from the original on 2019-02-27. สืบค้นเมื่อ 2013-06-30. ↑ "The Argus II Retinal Prosthesis ("Bionic Eye") Receives Medicare Approval". Visionware, American Printing House for the Blind. 2013-08-19. Archived from the original on 2018-12-31. ↑ "A Second Artificial Retina Option for the E.U." Technology Review. 2013-07-03. ↑ Bainbridge, James W.B. ; Smith, Alexander J.; Barker, Susie S.; Robbie, Scott; Henderson, Robert; Balaggan, Kamaljit; Viswanathan, Ananth; Holder, Graham E.; Stockman, Andrew; Tyler, Nick; Petersen-Jones, Simon; Bhattacharya, Shomi S.; Thrasher, Adrian J.; Fitzke, Fred W.; Carter, Barrie J.; Rubin, Gary S.; Moore, Anthony T.; Ali, Robin R. (2008). "Effect of Gene Therapy on Visual Function in Leber's Congenital Amaurosis". New England Journal of Medicine. 358 (21): 2231–9. CiteSeerX 10.1.1.574.4003. doi:10.1056/NEJMoa0802268. PMID 18441371. ↑ Commissioner, Office of the. "Press Announcements - FDA approves novel gene therapy to treat patients with a rare form of inherited vision loss". www.fda.gov (in อังกฤษ). Archived from the original on 2019-03-12. สืบค้นเมื่อ 2019-01-16. ↑ "Spark's price for Luxturna blindness gene therapy too high: ICER". Reuters. 2018-01-13. Archived from the original on 2018-12-05. ↑ Mezer, E; Babul-Hirji, R; Wise, R; Chipman, M; Dasilva, L; Rowell, M; Thackray, R; Shuman, C. T.; Levin, A. V. (2007). "Attitudes regarding predictive testing for retinitis pigmentosa". Ophthalmic Genet. 28 (1): 9–15. doi:10.1080/13816810701199423. PMID 17454742. ↑ Parmeggiani, F (2011). "Clinics, Epidemiology and Genetics of Retinitis Pigmentosa". Current Genomics. 12 (4): 236–7. doi:10.2174/138920211795860080. PMC 3131730. PMID 22131868. ↑ Hamel, Christian (2006). "Retinitis pigmentosa". Orphanet Journal of Rare Diseases. 1: 40. doi:10.1186/1750-1172-1-40. PMC 1621055. PMID 17032466. ↑ Prokisch, Holger; Hartig, Monika; Hellinger, Rosa; Meitinger, Thomas; Rosenberg, Thomas (2007). "IOVS - A Population-Based Epidemiological and Genetic Study of X-Linked Retinitis Pigmentosa". Investigative Ophthalmology & Visual Science. 48 (9): 4012–8. doi:10.1167/iovs.07-0071. PMID 17724181. ↑ Haim, Marianne (2002). 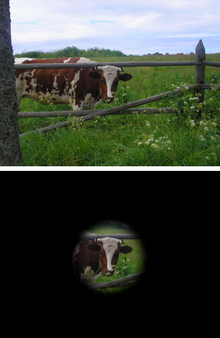 "The epidemiology of retinitis pigmentosa in Denmark". Acta Ophthalmologica Scandinavica. 80: 1–34. doi:10.1046/j.1395-3907.2002.00001.x. ↑ "Ophthalmologists Implant Five Patients with Artificial Silicon Retina Microchip To Treat Vision Loss from Retinitis Pigmentosa" (Press release). Rush University Medical Center. 2005-01-31. Archived from the original on 2005-02-08. สืบค้นเมื่อ 2007-06-16. ↑ MacLaren, R. E.; Pearson, R. A.; MacNeil, A.; Douglas, R. H.; Salt, T. E.; Akimoto, M.; Swaroop, A.; Sowden, J. C.; Ali, R. R. (2006). "Retinal repair by transplantation of photoreceptor precursors". Nature. 444 (7116): 203–7. Bibcode:2006Natur.444..203M. doi:10.1038/nature05161. PMID 17093405. ↑ Sato, Shigeru; Omori, Yoshihiro; Katoh, Kimiko; Kondo, Mineo; Kanagawa, Motoi; Miyata, Kentaro; Funabiki, Kazuo; Koyasu, Toshiyuki; Kajimura, Naoko; Miyoshi, Tomomitsu; Sawai, Hajime; Kobayashi, Kazuhiro; Tani, Akiko; Toda, Tatsushi; Usukura, Jiro; Tano, Yasuo; Fujikado, Takashi; Furukawa, Takahisa (2008). "Pikachurin, a dystroglycan ligand, is essential for photoreceptor ribbon synapse formation". Nature Neuroscience. 11 (8): 923–31. doi:10.1038/nn.2160. PMID 18641643. ↑ Levenstein, Steve (2008-07-24). "Lightning-Fast Vision Protein Named After Pikachu". InventorSpot.com. Halcyon Solutions. ↑ Barragán, L; Borrego, S; Abd El-Aziz, MM; El-Ashry, MF; Antiñolo, G (January 2008). "Genetic analysis of FAM46A in Spanish families with autosomal recessive retinitis pigmentosa: characterisation of novel VNTRs". Annals of Human Genetics. 72 (Pt 1): 26–34. doi:10.1111/j.1469-1809.2007.00393.x. PMID 17803723. ↑ Busskamp, V.; Duebel, J.; Balya, D.; Fradot, M.; Viney, T. J.; Siegert, S.; Groner, A. C.; Cabuy, E.; Forster, V.; Seeliger, M.; Biel, M.; Humphries, P.; Paques, M.; Mohand-Said, S.; Trono, D.; Deisseroth, K.; Sahel, J. A.; Picaud, S.; Roska, B. (2010). "Genetic Reactivation of Cone Photoreceptors Restores Visual Responses in Retinitis Pigmentosa" (PDF). Science. 329 (5990): 413–7. Bibcode:2010Sci...329..413B. doi:10.1126/science.1190897. PMID 20576849. ↑ "Experiments show retinitis pigmentosa is treatable". Stem Cells Freak. 2012-12-22. Archived from the original on 2018-12-13. 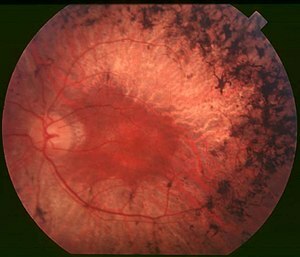 ↑ "Two Treatments for Retinitis Pigmentosa Move Closer to Clinical Trials" (Press release). Columbia University Medical Center. 2012-12-20. Archived from the original on 2018-06-27. สืบค้นเมื่อ 2016-08-07. ↑ Wen, Rong; Luo, Lingyu; Huang, Dequang; Xia, Xin; Wang, Zhengying; Chen, Pingping; Li, Yiwen (March 2012). "Mesencephalic Astrocyte-derived Neurotrophic Factor (MANF) Protects Rod and Cone Photoreceptors from Degeneration in Transgenic Rats Carrying the S334ter Rhodopsin Mutation". Invest. Ophthalmol. Vis. Sci. 53 (14): 2581. สืบค้นเมื่อ 2016-08-07. ↑ Wen, Rong; Luo, Lingyu; Huang, Dequang; Xia, Xin; Wang, Zhengying; Chen, Pingping; Li, Yiwen (2012-05-07). Mesencephalic Astrocyte-derived Neurotrophic Factor (MANF) Protects Rod and Cone Photoreceptors from Degeneration in Transgenic Rats Carrying the S334ter Rhodopsin Mutation. ARVO 2012. ↑ Tochitsky, Ivan; Polosukhina, Aleksandra; Degtyar, Vadim E.; Gallerani, Nicholas; Smith, Caleb M.; Friedman, Aaron; Van Gelder, Russell N.; Trauner, Dirk; Kaufer, Daniela; Kramer, Richard H. (2014). "Restoring Visual Function to Blind Mice with a Photoswitch that Exploits Electrophysiological Remodeling of Retinal Ganglion Cells". Neuron. 81 (4): 800–13. doi:10.1016/j.neuron.2014.01.003. PMC 3933823. PMID 24559673. ↑ Bakondi, Benjamin; Lv, Wenjian; Lu, Bin; Jones, Melissa K.; Tsai, Yuchun; Kim, Kevin J.; Levy, Rachelle; Akhtar, Aslam Abbasi; Breunig, Joshua J.; Svendsen, Clive N.; Wang, Shaomei (2016). "Molecular Therapy - Abstract of article: In Vivo CRISPR/Cas9 Gene Editing Corrects Retinal Dystrophy in the S334ter-3 Rat Model of Autosomal Dominant Retinitis Pigmentosa". Molecular Therapy. 24 (3): 556–563. doi:10.1038/mt.2015.220. PMC 4786918. PMID 26666451. ↑ "Gene editing technique improves vision in rats with inherited blindness: Data show the new 'CRISPR/Cas9' system potentially can be used to prevent retinal damage in a type of retinitis pigmentosa". Science Daily. 2016-01-08. สืบค้นเมื่อ 2016-01-15. ↑ "FDA approves novel gene therapy to treat patients with a rare form of inherited vision loss". FDA. 2017-12-19. Archived from the original on 2019-03-12. ↑ Bourzac, Katherine. "A blind woman in Texas is first person to undergo optogenetic therapy, which could let her see again if successful". technologyreview.com. หน้านี้แก้ไขล่าสุดเมื่อวันที่ 18 เมษายน 2562 เวลา 05:18 น.